Nickolai is a dedicated and demanded musician of contemporary, classical and folk music. From an early age he has been studying Cello and music in his native country Bulgaria. Nickolai Kolarov earned his doctoral degree in Cello from the University of Minnesota where he studied with Tanya Remenikova, former student of Mstislav Rostropovich. He also studied with Igor Gavrish from the Moscow Conservatory of Music and Nina Gordon at the University of Missouri. As an ethnomusicologist Nickolai delivers lectures on Balkan Folk Music in colleges and schools throughout the States. 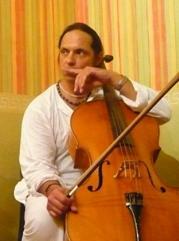 He is a contributor for the “Bulgarian Folk Music” section and listening tools of Alves, William. 2006. Music of the Peoples of the World. Australia: Thomson Schirmer. He has been playing Bulgarian folk music with Niks and Mila Vocal Ensemble. Nickolai Kolarov is the producer and one of the performers of the Balkan Contemporary Chamber Music concert series Balkanicus in Minnesota since 2003.